Home > What We Do > Topics > Designing Sustainable Cities: What About the People? Can urban planning and design make cities more resilient? WRI’s Robin King and University of Oxford’s Cathy Baldwin as they answer this question, which they addressed in their new book, Social Sustainability, Climate Resilience and Community-Based Urban Development: What About the People? Can urban planning and design make cities more resilient? 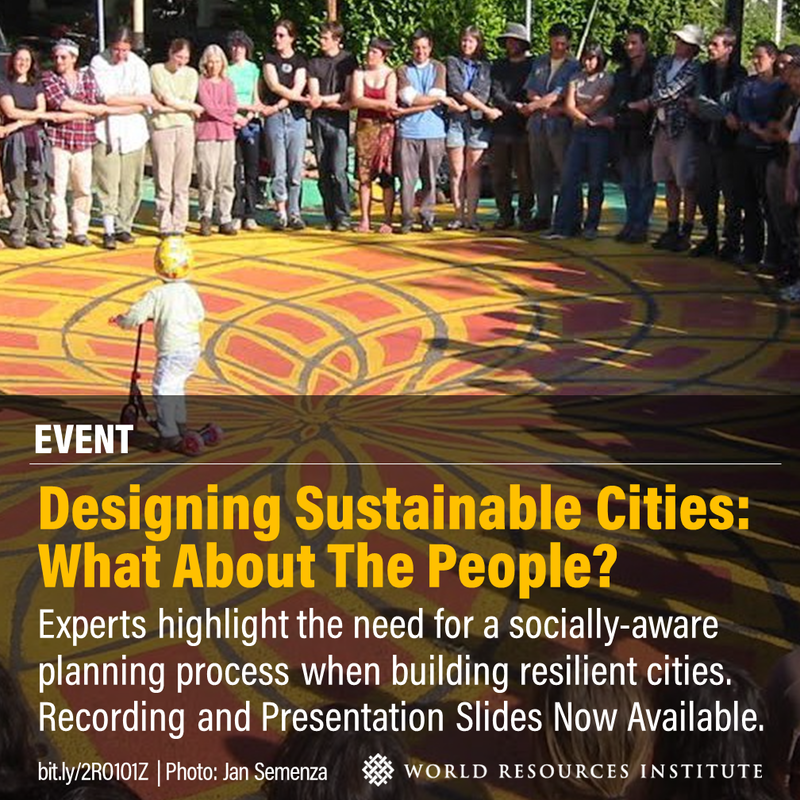 Join WRI’s Robin King and University of Oxford’s Cathy Baldwin as they answer this question, which they address in their new book, Social Sustainability, Climate Resilience and Community-Based Urban Development: What About the People? Urban communities around the world face increased stress from natural disasters linked to climate change and urban pressures such as increased heat, flooding, and insufficient services. Fourteen case studies from around the world -- focusing on housing, public space, transport, and natural disasters like flooding and earthquakes -- stress how social networks and social cohesion may be even more important for resilient cities than solely their physical structures. Robin King and Cathy Baldwin explore the relationship between urban built environments and pro-community behaviors and psychological responses, which include positive acts and states of mind that are beneficial to communities and their residents.